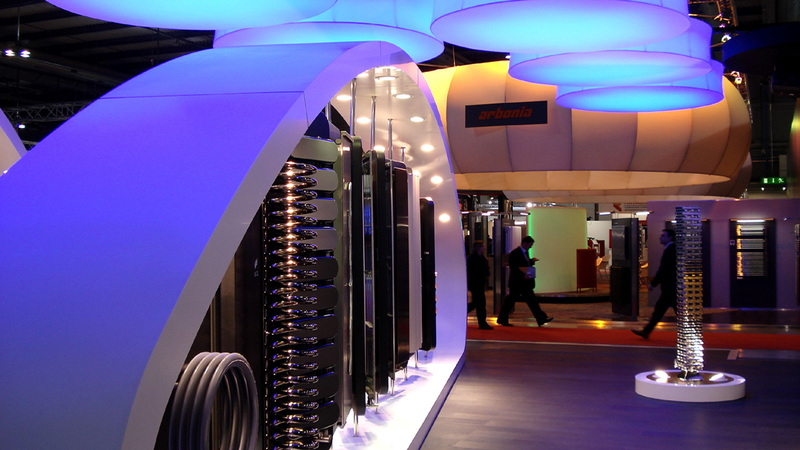 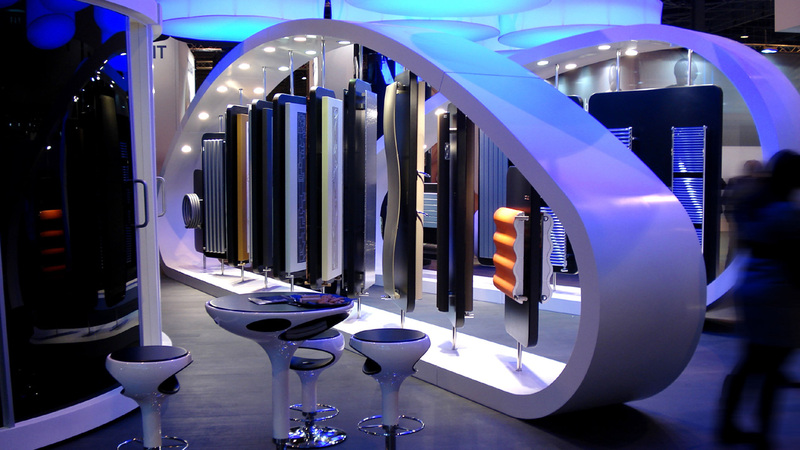 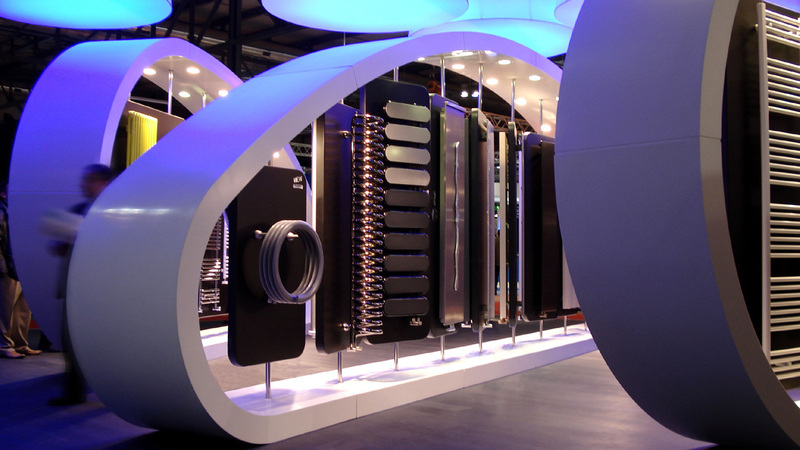 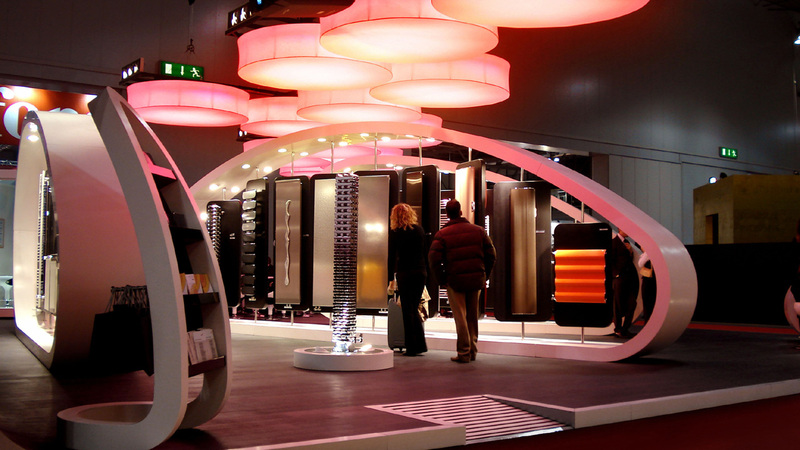 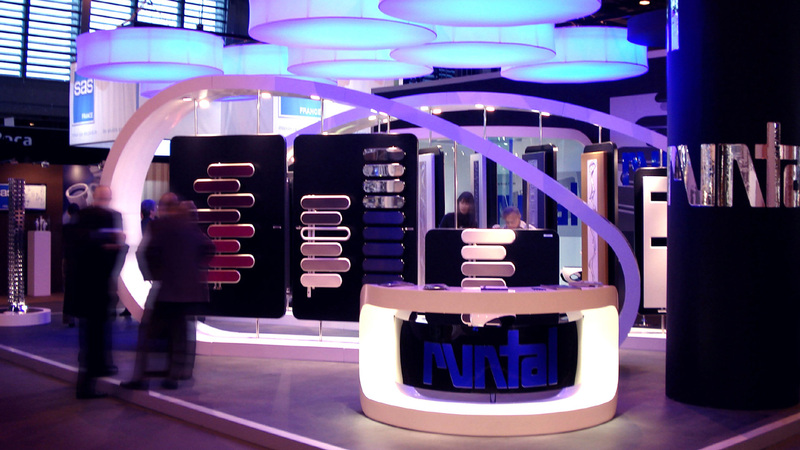 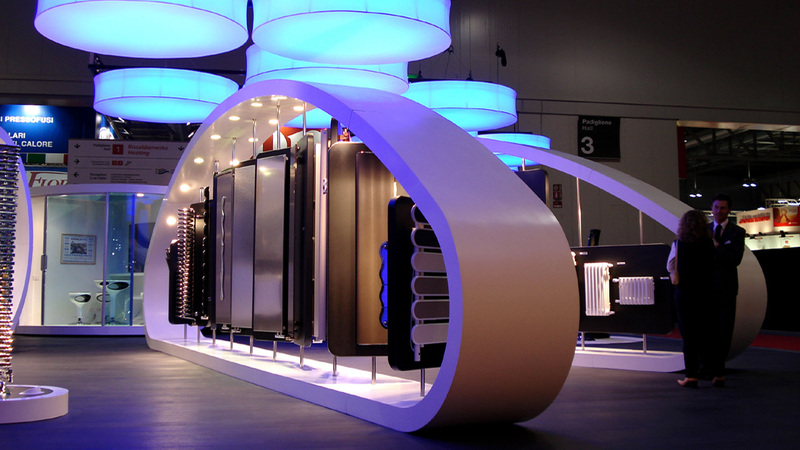 It is a 260 sqm modular exhibition stand in DuPont™ Corian® for the Runtal a brand of the Zehnder Group, leader company in the development of heating systems. 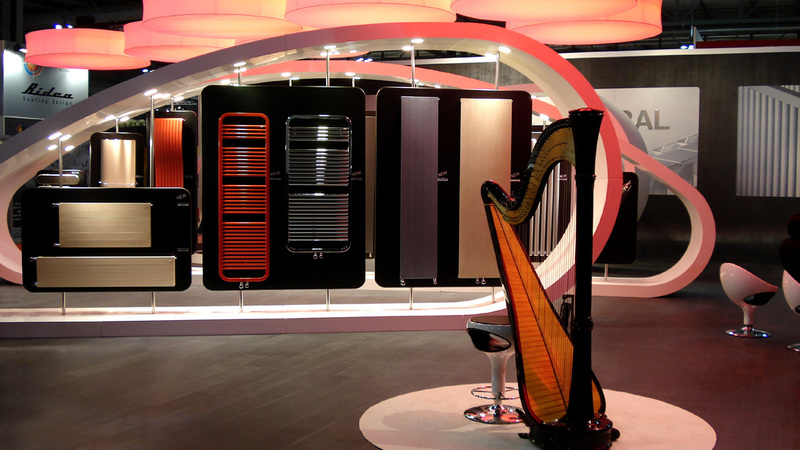 The ispiration came from observing the harp as a sensual and magic musical instrument, so large harps in Corian from 6 to 10 metres long and 3 metres high, were designed to accomodate items of the Runtal collections on rotating black panels. 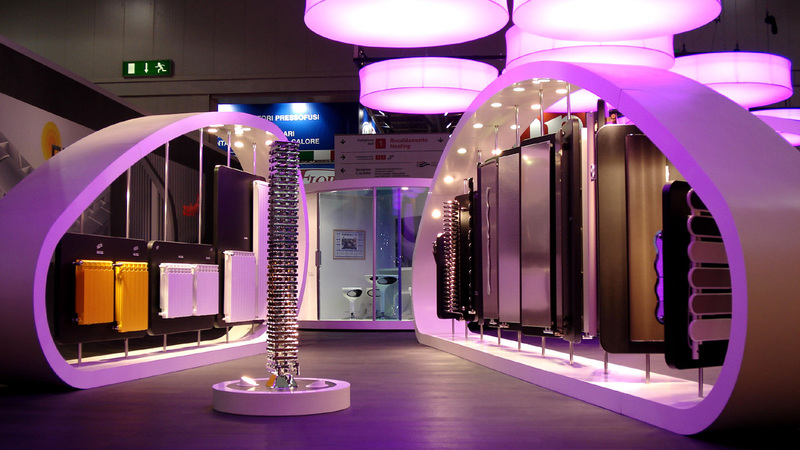 The composition of harps has been made simpler thanks to the use of light ashlars with sophisticated concealed steel closures. 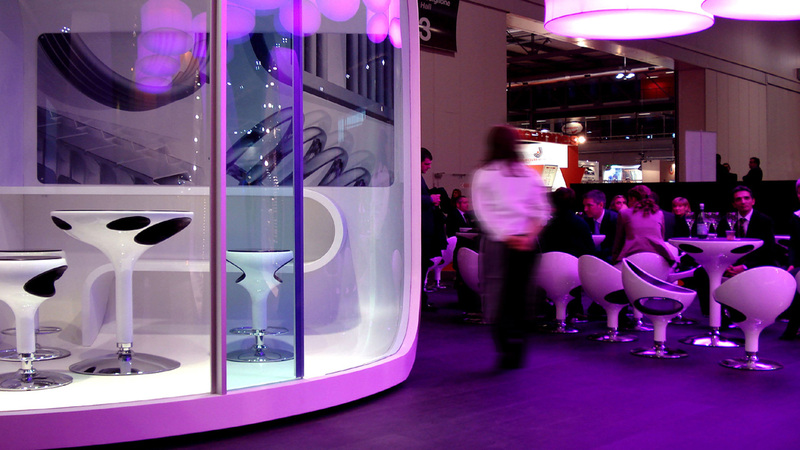 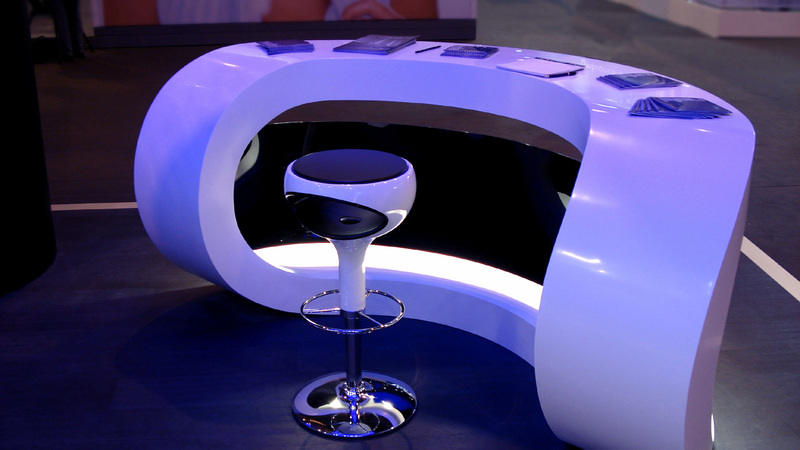 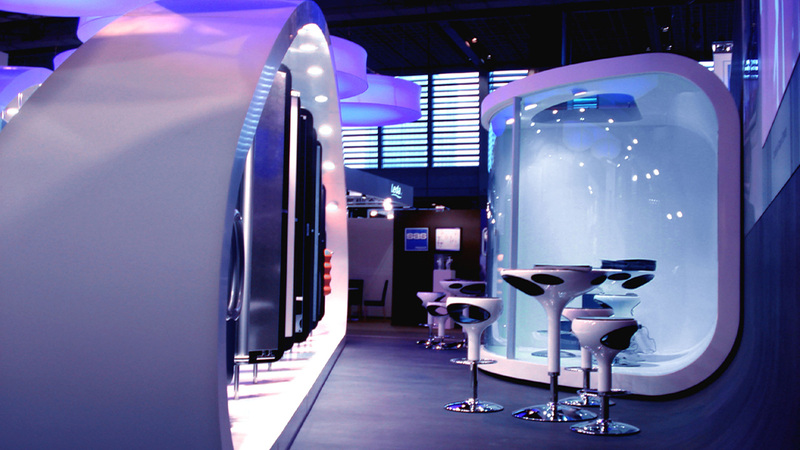 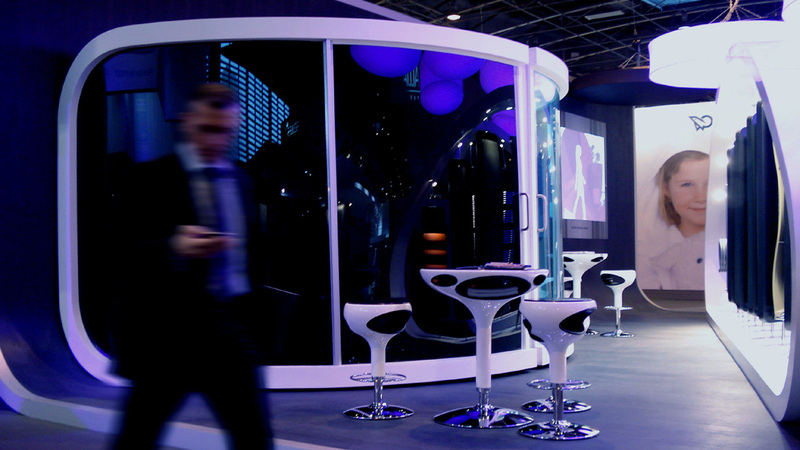 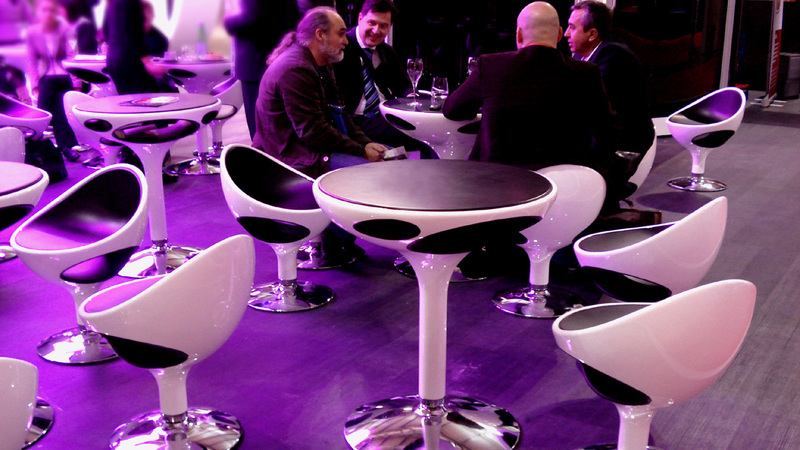 The complete corian modular exhibition stand was projected to be easily moved around an European tours at the main exhibition fairs. 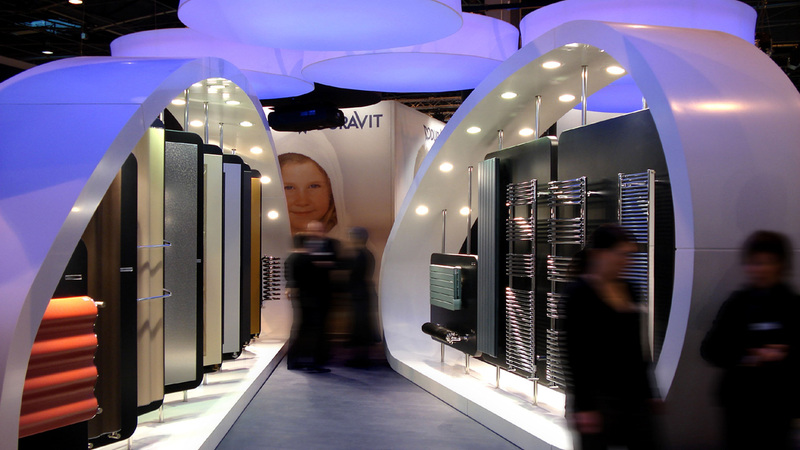 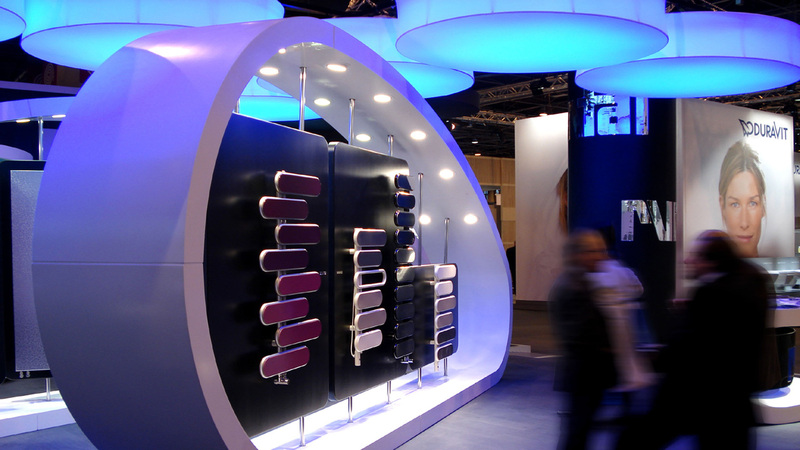 The stand houses three large display elements (harps), one transparent meeting point, three storage cabinets, one reception and brochure cases, all following the same soft line in Corian, designed to blend. 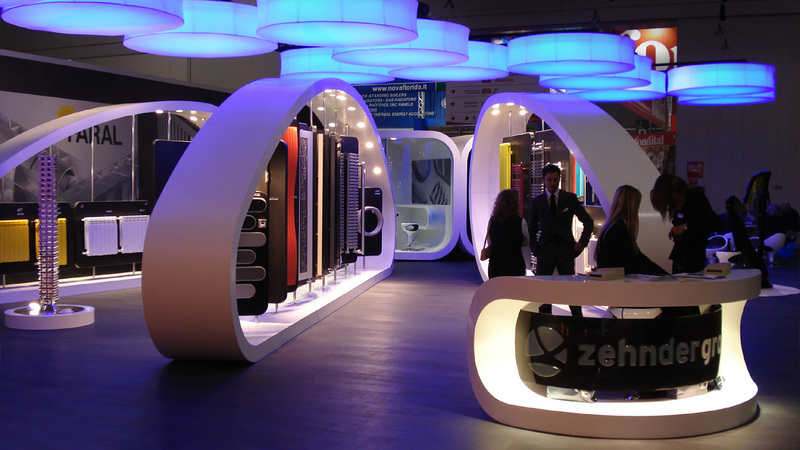 All the furniture, tables, chairs and stools are part of the Ring Collection designed by Zema for the Giovannetti Collezioni d’Arredamento firm. 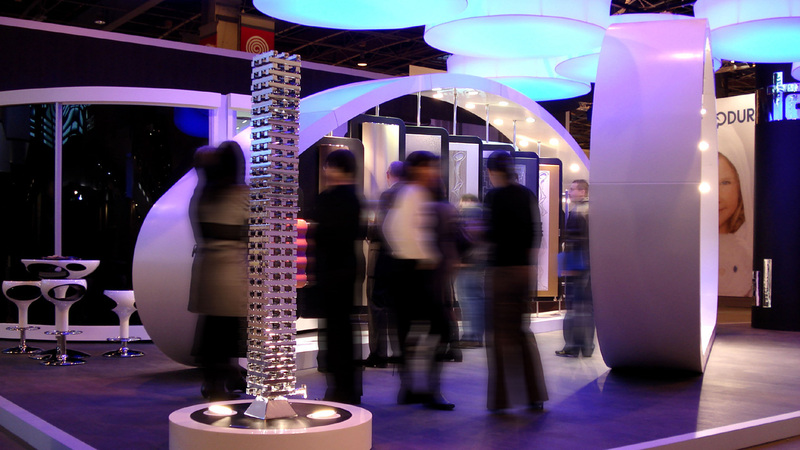 The illumination system is suspended and made up of 14 large aluminium structured cylinders, 2 metres wide and covered in Barrisol, that contain RGB cromatic variation fluoroscent lamps, designed again by Zema and made in collaboration with the Zumtobel company.